Eating healthy has been going very well in this house. I never knew that there were so many healthy recipes that were so delicious. I mean, most of the recipes we have tried are packed full of flavor. This recipe for Chana Saag, for example, is full of flavor from the garlic, onions, ginger and curry. It was so delicious. With the chickpeas and quinoa for protein, it kept me satisfied for a long time, but I didn't feel disgustingly over full after eating it at for lunch at work. I think I've mentioned before how much I love the Budget Bytes website. She makes really awesome affordable meals that anyone can make on their own. I mean, I never would have thought that we would be making Indian food here in our tiny apartment. 1. Dice the onion, mince the garlic, and grate the ginger. Sauté the onion, garlic, and ginger in a large skillet with the olive oil over medium heat until the onions soften. I like my food to be a little bit garlicky, so we always add a little bit of extra garlic (and sometimes ginger). 2. Add the curry powder and continue to sauté with the onion mixture for more minute. Add water to the skillet along with the fresh spinach and continue to sauté until the spinach has wilted. The water will help steam and wilt the spinach. 3. Drain and rinse the chickpeas. Add them to the skillet along with the tomato sauce. Stir well to distribute the spices in the sauce and heat through (5 minutes). I recommend serving with quinoa, but you can also serve with rice. this sounds so good! and it's so different from anything I've ever tried before! This sounds delicious and not your typical meal! 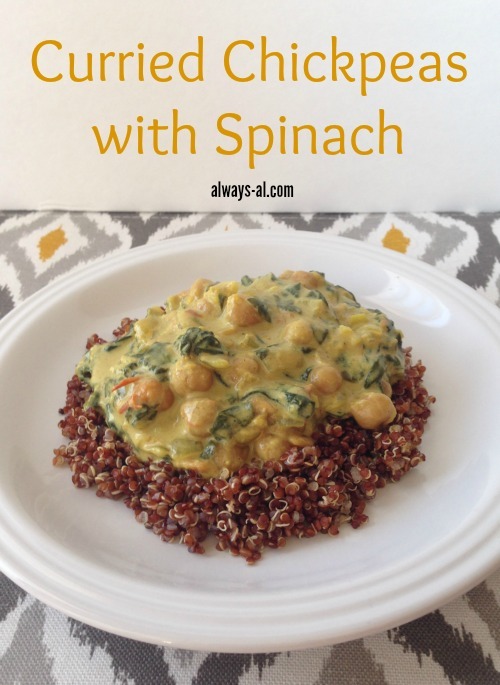 I love finding new and healthy recipes that I can feed my family! Can't wait to try it. This looks good. I think I would totally give this a try. I love all of these things! Can't wait to try it! I highly suggest adding extra curry! You should! Let me know how it goes! 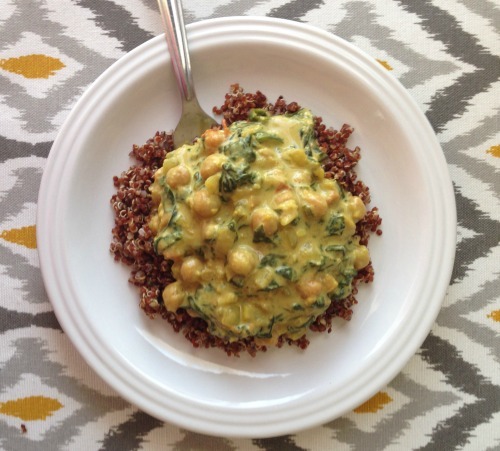 I love that the protein comes from the chickpeas and the quinoa. Healthy and delicious! Right? It's very easy, too!